Our yearly Memorial in Bardejov was held on Wednesday June 27th. 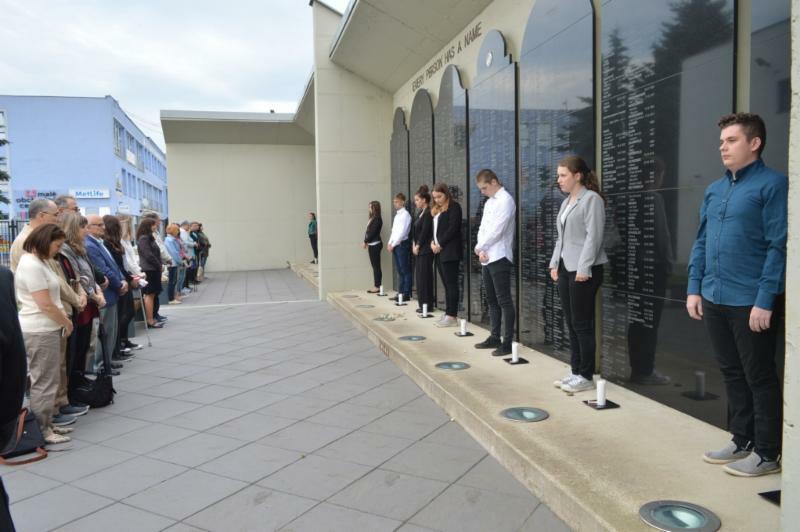 This year’s theme was inspired by the ceremony of the Israeli embassy in Bratislava honoring four people from Bardejov and its vicinity as the Righteous Among Nations. As always, the event was planned to take place in the Memorial, however, due to weather conditions, only the lighting of the memorial candles in front of the Name Tablets took place there. 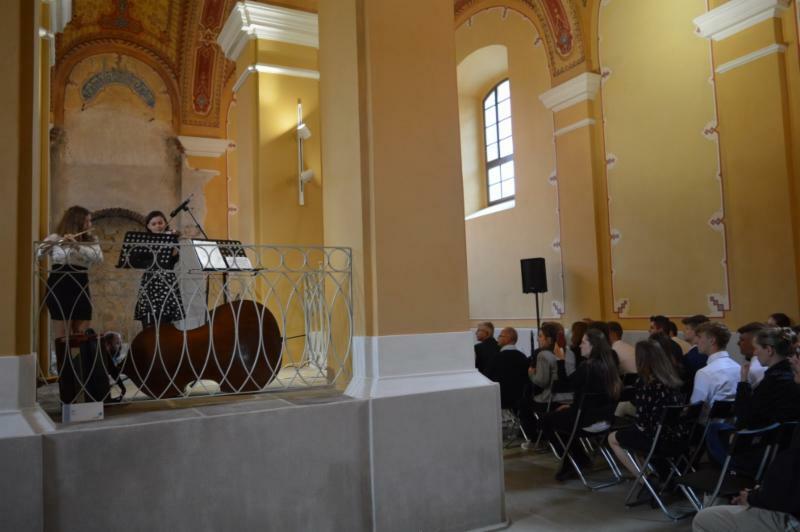 Afterwards, people walked to the Old Synagogue to hear touching performances: Local students from Leonard Stockel High School initiated the ceremony with music from Schindler’s list and ended it with a Jewish traditional melody. 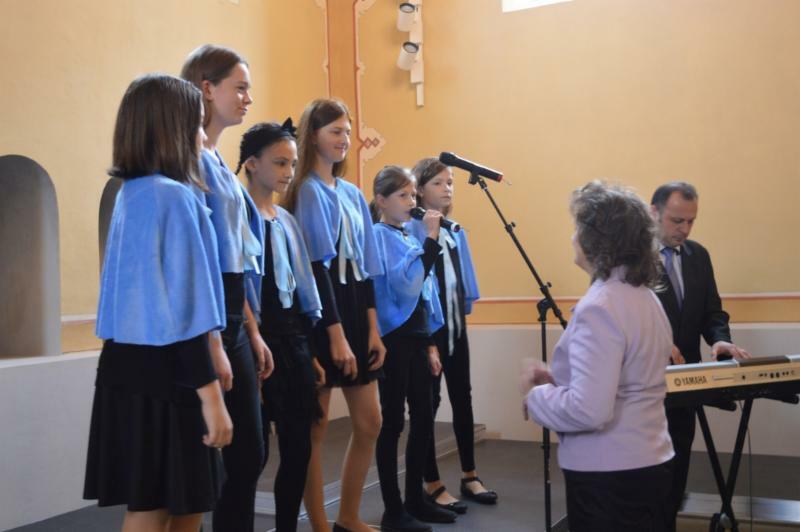 The Children's Choir from Modrá ZUŠ – Blue Art School in Bardejov have been engaging our emotions with their beautiful Hebrew singing since our first event in 2014 and they continue to inspire us this year as well. Ms. Orit Stieglitz, Executive Director of BJPC and Ms. Anna Humbert—our new Manager of Operations in Bardejov—read a speech by Emil Fish, the Founder and President of BJPC; and Vice-Mayor Vladimír Savčinský represented the City of Bardejov and gave an uplifting talk. Peter Hudák reminded the crowd of the valuable stories of the four people from Bardejov and its vicinity who on January 31st received the award of Righteous Among Nations by Yad Vashem. 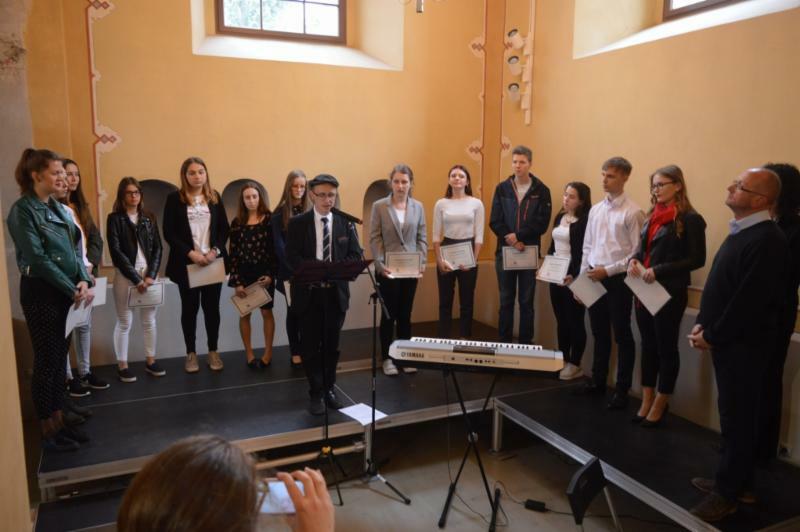 Indeed, Adam Bomba, Štefan Tarcala, Jozef Kisel and Vasiľ Kyjovský continue to be an inspiration for young people as we learned from the essays the students wrote for this year’s Essay Competition on the topic “Righteous among the Nations – what makes them unique?“. 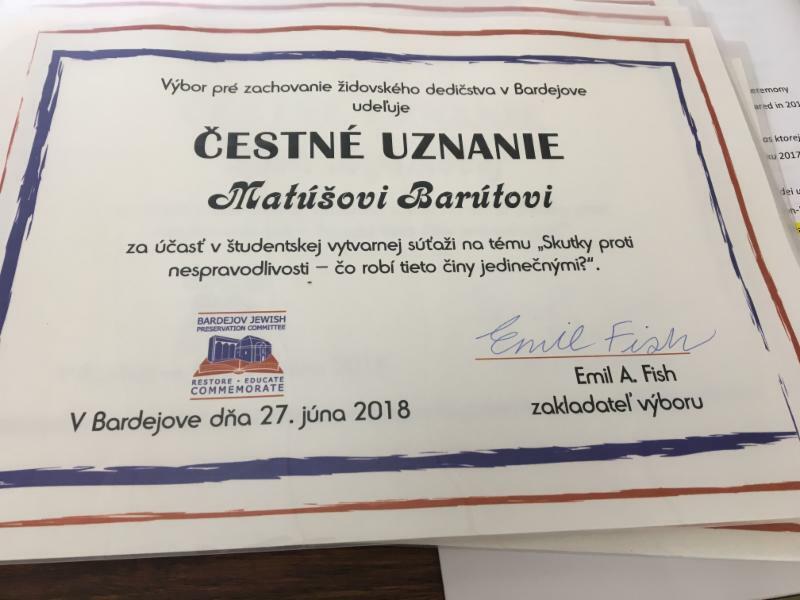 Twenty essays were submitted by high school students from Bardejov, a significant increase in entries since previous years. Once translated to English we will publish the three best essays on our website. Chairman of Community Organization in Bardejov, Mr. Jozef Jarina, thanked the students for their efforts and motivated them to continue discussing these issues so as to bring about a better future for all. For the first time this year, we also held an Art Competition for High Schools on the same topic as the essays. The best interpretations of the theme combined with the quality of the art piece were considered by the committee when choosing the winners. 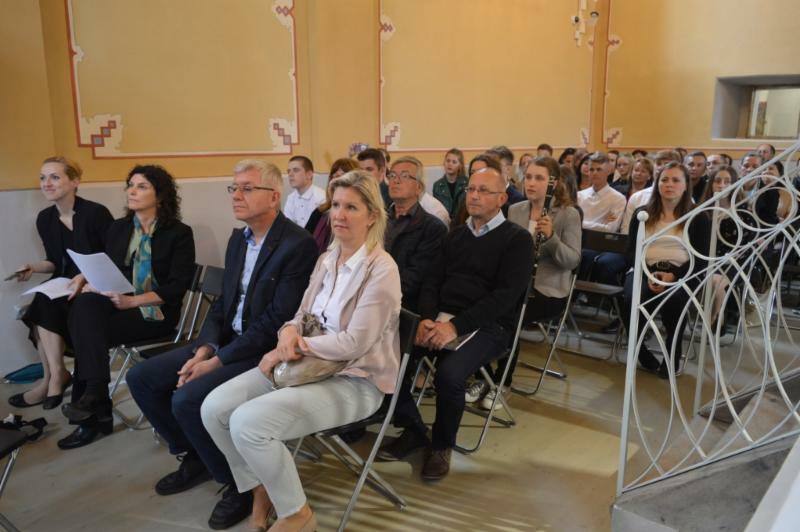 The event was attended by local Bardejov citizens, family members of Righteous Among Nations from Bardejov, and guests from Slovakia and the United States. We are very grateful to all the participants and performers and for the ongoing support from the City and the teachers, especially Ms. Jana Lešková from Leonard Stockel High School and Marta Kmeťová from Modrá ZUŠ in Bardejov. 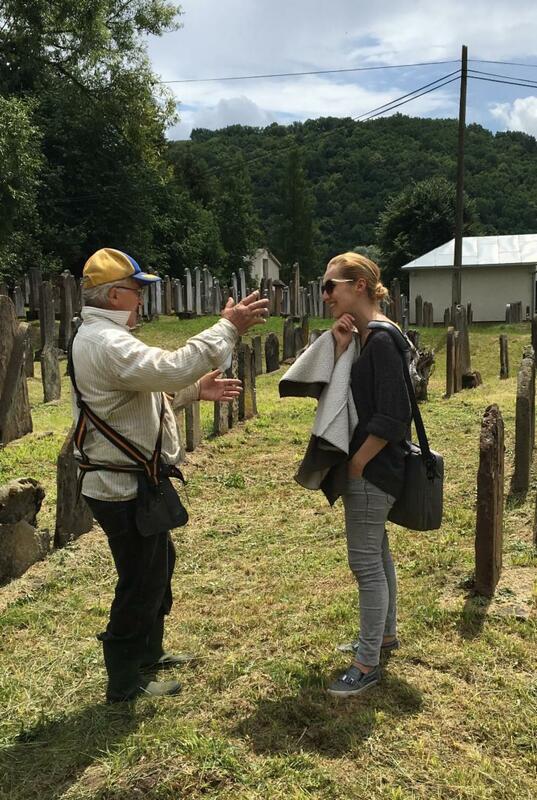 We are happy to announce the addition of a new member to our team: Ms. Anna Humbert joined Bardejov Jewish Preservation Committee as the Manager of Operations in Bardejov. Anna will be involved with the organization’s activities in Bardejov and Slovakia including communication with local citizens and public officials, PR, events, and the Suburbia development. Anna will work together with the Hudáks, and we believe that jointly we will better succeed in the development of Jewish heritage in Bardejov. 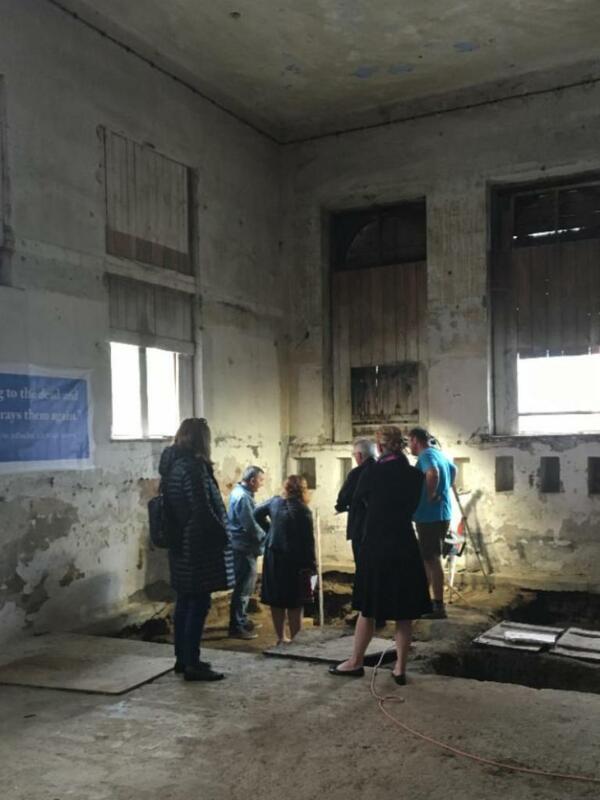 Excavation work—under Beith Hamidrash building and its yard—started on May 28, 2018. 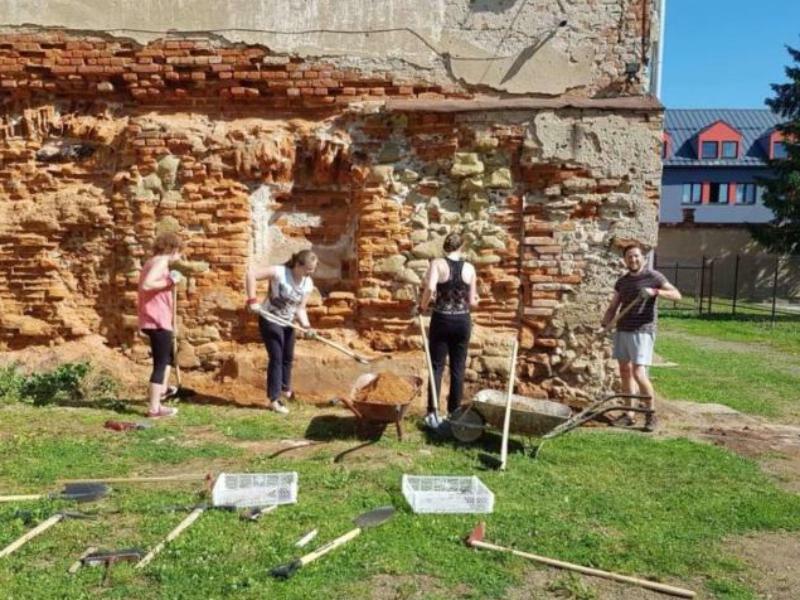 A team of young volunteers from Leonard Stockel High School in Bardejov, supervised by BJPC Associate Pavol Hudák and archaeologist Peter Harčár, uncovered the remains of older structures which once stood in place of Beith Hamidrash. Indeed, according to old maps from the 1800’s there was an old synagogue and possibly a mikveh where the Beith Hamidrash now stands. 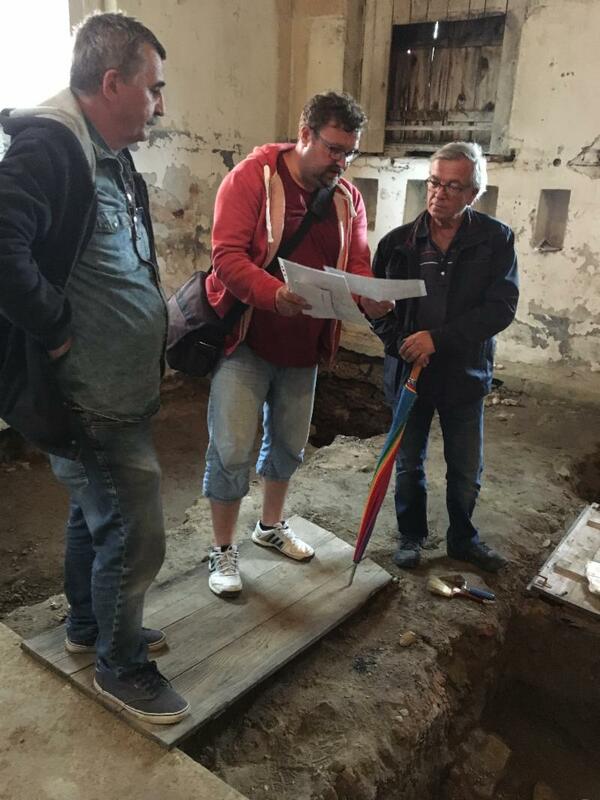 BJPC representative—Architecture Conservation Specialist Giora Solar from Israel—visited Bardejov from June 25-28 to supervise the excavation work and to provide his insight and recommendations. Mr. Solar assisted the team with the direction of their research. 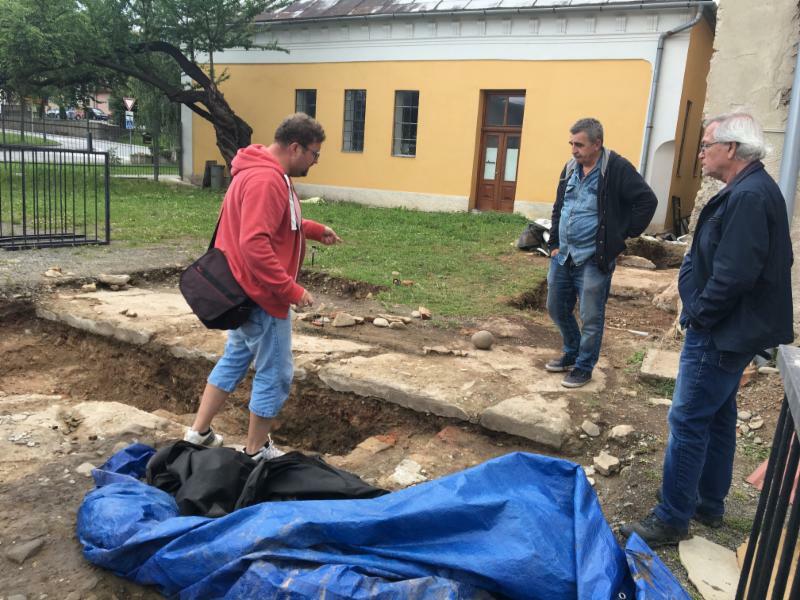 The excavation will conclude by mid July 2018, and by then lead archaeologist Peter Harčár from the Monument Board of Slovakia will be able to assess the significance of the findings before we proceed with the restoration.